In addition to the wrap I made for my Mother-in-law, I also knit two pairs of socks for Christmas gifts. 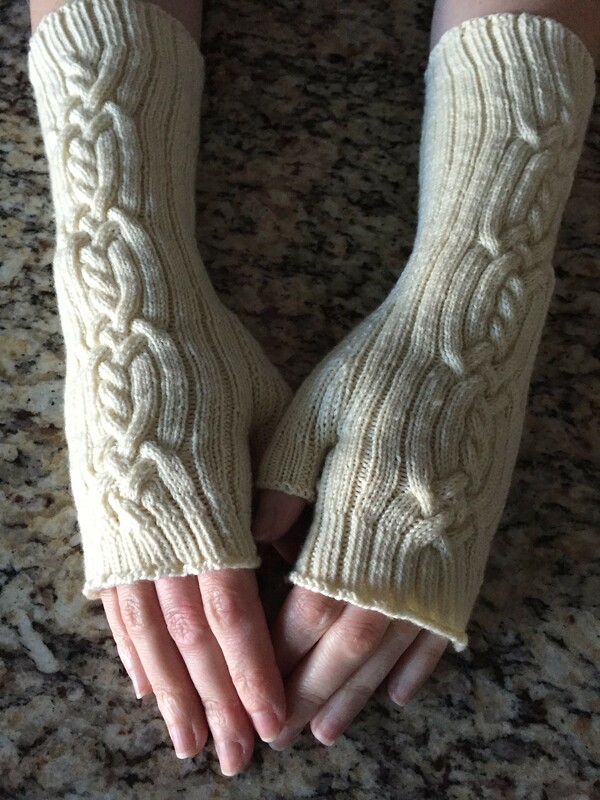 I knit a pair for my Brother-in-law, John, who is back from China now. I'd never knit him socks before, but he seems to be enjoying them. I'm not sure if he believes me that they are washable (I used Trekking XXL for them), but I'm sure he'll figure it out eventually. These are plain vanilla, stockinette socks with a Fish Lips Kiss Heel. I also knit a pair for Mickael because he's worn a couple of his pairs of socks out. (Wool socks aren't meant to be worn outside on the concrete driveway.) His are also Trekking XXL (the added nylon helps prevent holes when the socks are not respected). I don't have a picture of Mickael's socks, but his are dark gray, dark khaki, and a very dark blackish blue. I used the waffle socks stitch pattern for his socks. Both of these socks were gifted for Christmas. 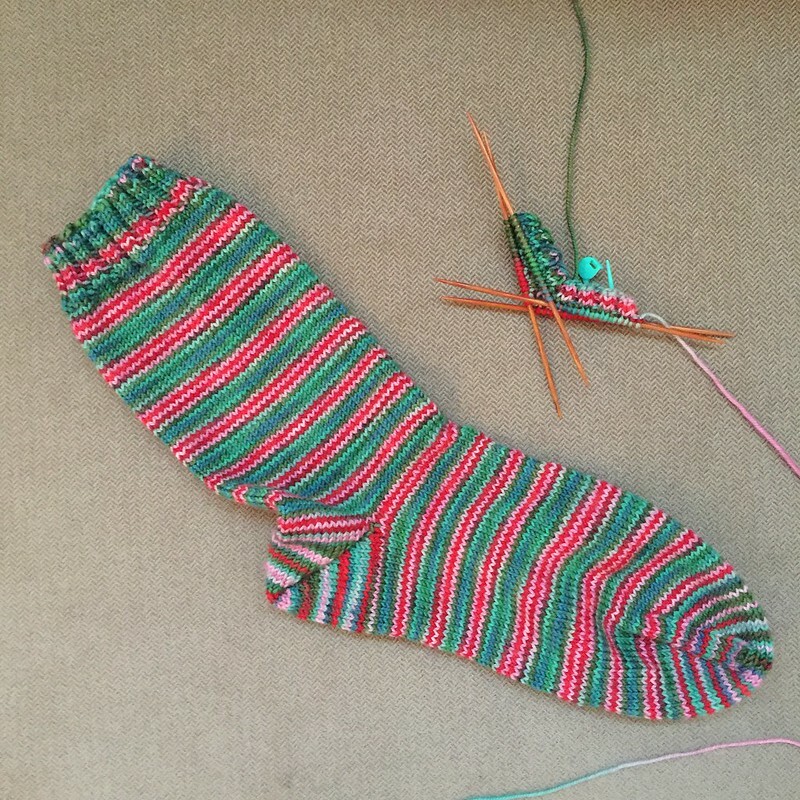 Once I finished knitting them, I cast on for a pair of Christmas socks of my own. 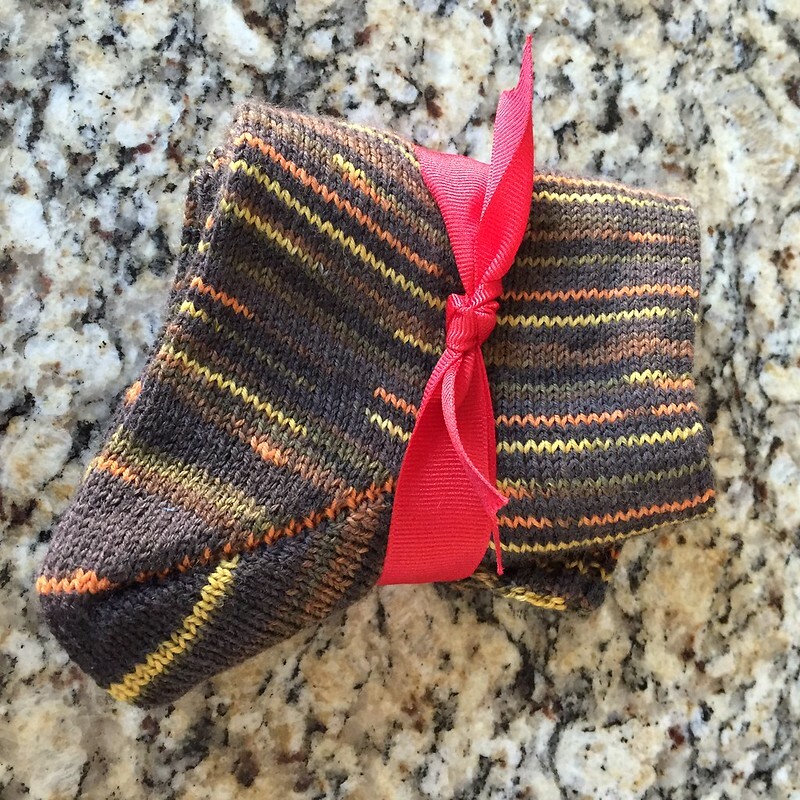 This is Blue Moon Fiber Arts Socks that Rock lightweight in Comfort and Joy. They were one of the skeins I got when I was part of the Rockin' Sock Club a few years back. I love how they're knitting up like peppermint sticks. Obviously, since I just started the second sock last night, these will be for next Christmas. This was one of the projects I was working on before Christmas, although it wasn't a Christmas present. 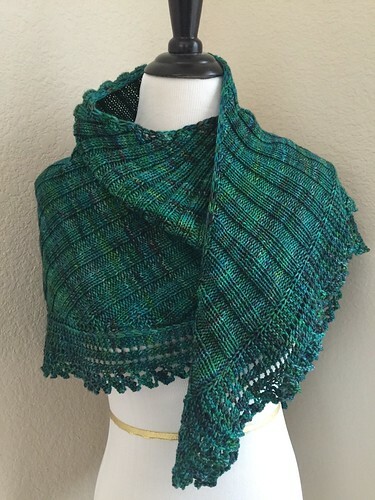 This is Treat (I made it earlier this Fall in a raspberry color) in Bugga in the Satin Green Forester color way, and I made it for my Mother-in-law's birthday. It was just as much fun to knit the second time as it was the first (although, let's face it, knitting anything in Bugga is fun). I used a little more than one and a half skeins of yarn, but I didn't count repeats or get measurements before I gifted it. It's definitely bigger than the one in the pattern, but it's smaller than the first one I made because my Mother-in-law is a petite lady. She was very appreciative and has even worn it already. 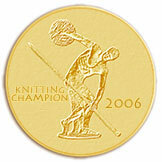 Isn't it nice when the people you love are knitworthy? 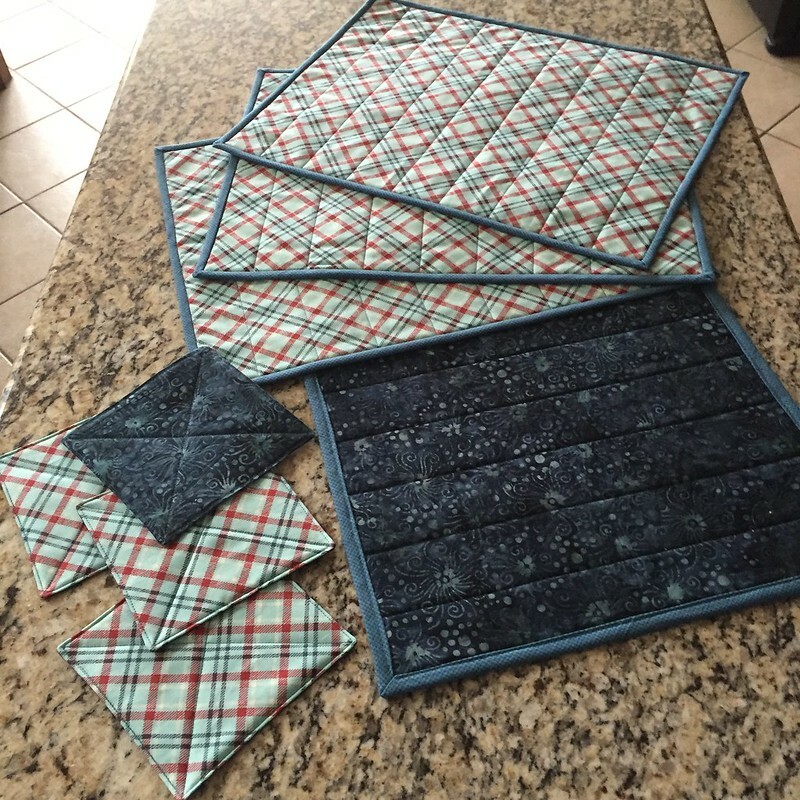 My third project for the Loopy Academy Sewing Edition was a set of four placemats. I've never made placemats before, but we use them around here constantly. I love the look of the fancy, pieced placemats, but once you plop a plate on them (or in Caleb's case, a giant pile of goldfish crackers), you can't see all the piecing. I decided to keep things simple and just use one fabric for each side and bind them with a third. I also added some simple quilting just to keep things from shifting around. One side has a bias printed plaid. 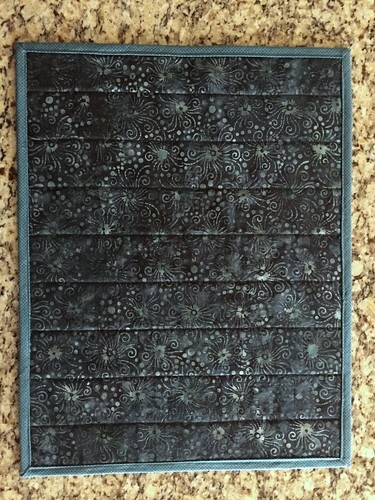 The other side has a dark batik. 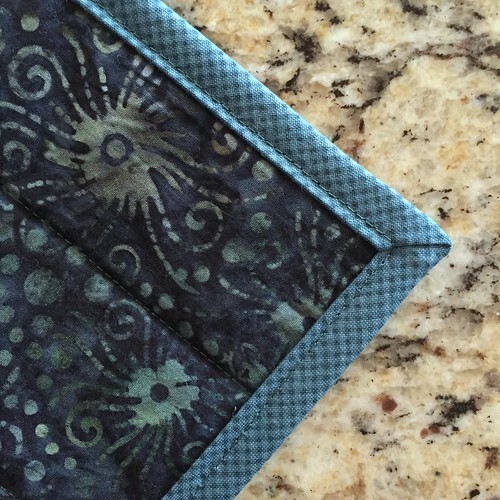 The binding is a bias cut, tiny check print. (I love plaids and checks as binding.) I did the binding completely by machine. I also used the leftover scraps for some little coasters. These don't have binding, I just sewed them and flipped them and added a bit of quilting. You can see them in the first picture. 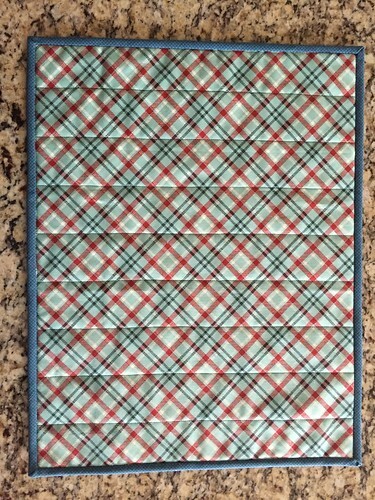 So now I've completed my first semester of Loopy Academy and I have a set of reversible placemats! I could definitely see myself making more of these, both the full size and the little coaster size. They were fast and fun to make. I am back to blogging normally now! I've finished my Christmas knitting (all on time), and last night I even finished my last project for Loopy Academy Sewing! I'll catch you guys up this week! This is my Seasonal Wallhanging project for Loopy Academy. 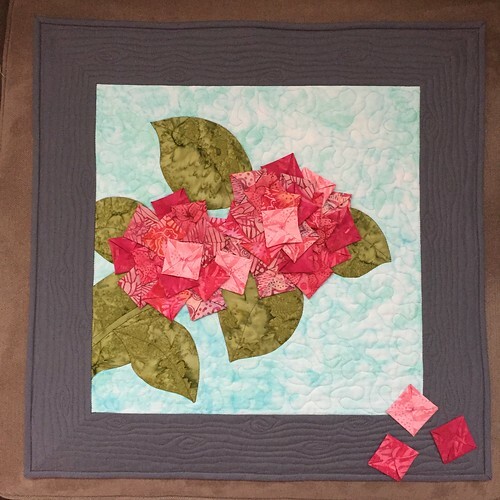 The design is a quilt block from Kumiko Sudo's Fabled Flowers book - this is the hydrangea. I started by appliqueing the leaves and stem onto the background by hand. Next I added the borders and quilted and bound it. Finally, I started folding blossoms (each one starts as a much larger square of fabric). Then I sat down and started sewing them onto the quilt. I waited until the end to sew on the blossoms because I wanted to quilt behind the flowers beforehand and I also wanted them supported by all three layers of the quilt. This meant that there are little knots all over the back side of the quilt, but I used a crazy, bright pink batik for the backing and since it's a wall hanging, the knots are against the wall anyway. Once I finished this project, I only had the placemats to make for my first semester of Loopy Academy. I'll show you those tomorrow. I'm hoping that it's not so dark around here and I can get photos today. Next semester I'm going to manage my time better and not wait until the last minute to finish Loopy Academy. I did have the sense to start with the most involved project and work towards the easiest, but if there had been any extra credit like there was last spring with Knitting Loopy Academy, I might not have finished. Just popping in to say hello! I'm still here and everything is fine. I've been working on Christmas projects, so there's nothing really bloggable. I've got one project finished and I'll finish the second today. I'm about halfway through the third and that's it for Christmas knitting. I'm 25% of the way through Christmas sewing, plus I have my wall hanging project and placemats to make for Loopy Academy. I've started the wall hanging but I've got a long way to go. I still fully plan to have all of this done on time, but blogging will continue to be sporadic through the end of the year. I'll pop in with pictures when I finish Loopy Academy stuff and once things have been gifted and blogging will resume it's regular schedule in the new year. Until then, I hope you all have a lovely Christmas and New Year's and anything else you might celebrate at this time of year! May your yarn be tangle free and the stitches not be dropped. Happy, happy, merry, merry, and to all a good night! 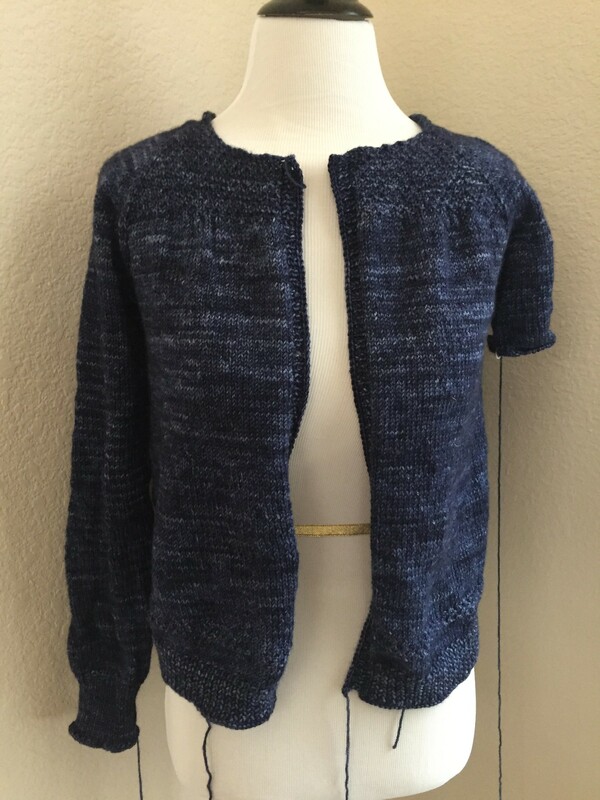 I’ve finished my Cables project for Loopy Academy, Knitting. This means I’ve finished another semester of Loopy Academy Knitting! These were meant to be socks, but part of the way through, I pulled one onto my arm to see what the cable pattern was looking like, and decided to make them mitts instead! I guess I’m lucky I have narrow feet and the ribbing in this pattern can compress to arm and hand sizes. They are knit in Malabrigo Sock in Natural. The pattern is Paraphernalia with a thumb gusset added that I basically figured out as I went (and kept notes for the second one). If I had thought it through, I could have used the thumb gusset from one of my mitt patterns, but my decision to turn socks into mitts was pretty spur of the moment. I’ve still got two more projects to make for Loopy Academy, Sewing so I need to get moving on those. I’m hoping to get started on my Seasonal Wallhanging later today. I’m still working away at my cardigan, along with everything I’m “supposed” to be working on before the end of the year! As you can see, I’ve got one sleeve finished and the other started. I’ve done the front bands, but not the neck band. Also, none of the ends have been woven in yet. I did get buttons for my cardigan, so I don’t have to worry about those anymore. I’ve been enjoying this project because it’s relaxing. My skeins are similar enough that I haven’t worried about alternating them and let’s face it, knitting with Pashmina is just wonderful! As far as the things I’m “supposed” to be working on, I have been. I’m actually making some progress on my Christmas knitting!